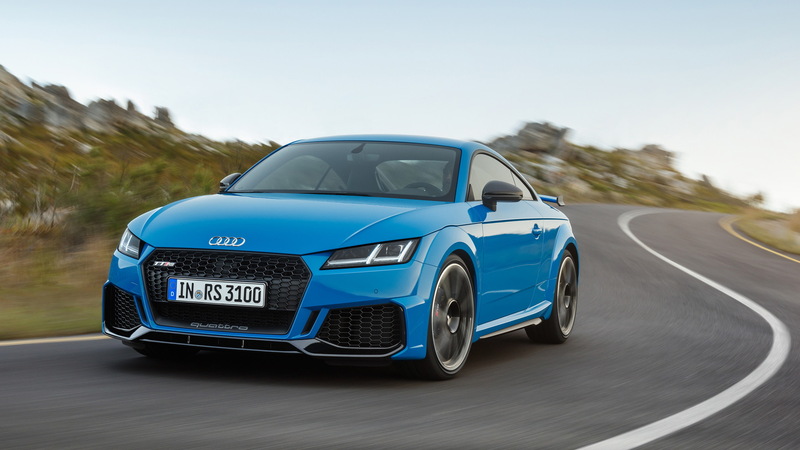 The Audi Sport division has implemented a round of updates for the TT RS for the 2019 model year. The TT RS is already a fast, agile car that does a good job of handling a track, despite it sharing a platform with the humble Volkswagen Golf (that says more about the Golf, really). For the update, the designers added a sharper look that provides a better indication of the potency within. The front fascia takes on a more rigid design, with the air intakes enlarged to add to the aggression. They also help feed air to additional radiators located behind the typical RS honeycomb grille. At the rear, there's a new fixed wing capped at either end by small winglets. There's also a revised diffuser sitting between two large oval exhaust tips in the typical RS design. Also new for 2019 are Turbo Blue, Tango Red metallic, and Kyalami Green exterior paint options. And the standard wheels are a 19-inch set while a 20-inch set is available. Moving inside, the designers added a red 12 o’clock marking on the steering wheel rim. They've also made available a new RS design package that adds red or blue highlights to the cabin on the air vent doors, the seat belts, and the floor mats. The extended RS design package also offers contrasting design elements on the seats and center console. Apple CarPlay and Android Auto smartphone integration is available. Sadly, there are no major mechanical mods. 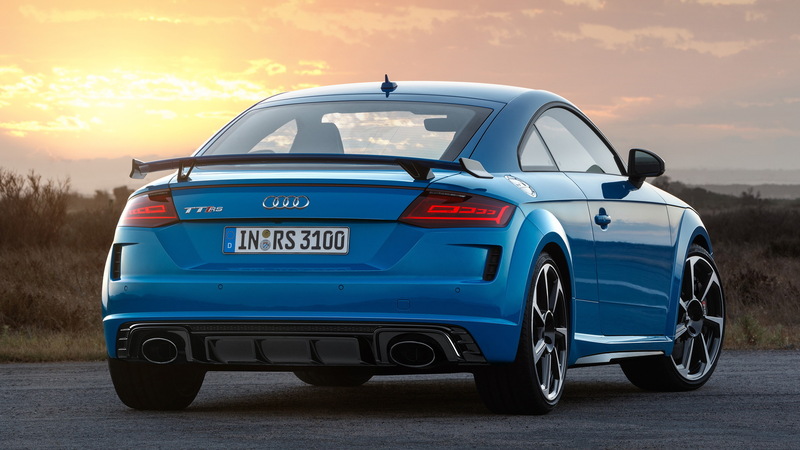 But as mentioned earlier, the TT RS is no slouch. Under the hood is a 2.5-liter turbocharged inline-5, whose output of 394 horsepower and 354 pound-feet of torque matches the outgoing model. Mated to a 7-speed dual-clutch transmission and all-wheel-drive system, the engine will rocket the car to 60 mph in only 3.6 seconds. The top speed is limited to 155 mph but buyers can opt to have this lifted to 174 mph. 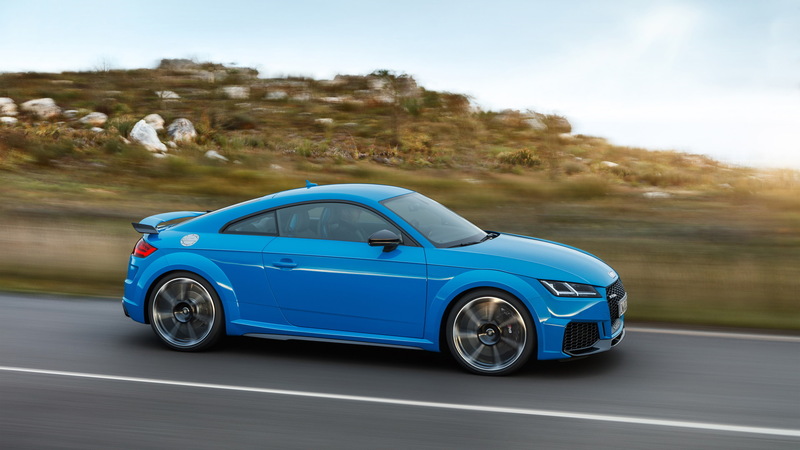 Following a debut at next week's 2019 New York International Auto Show, the updated TT RS will arrive in showrooms in the spring alongside an updated TT range. Pricing starts at $67,895, including destination. Alternatives include Audi's own RS 3, the BMW M2 and the Mercedes-AMG CLA45.